The UGJ (Ukrainian Geographic Journal) is leading scientific journal in Ukraine that covers fundamental and applied achievements in geography and cartography. It has been published quarterly since 1994. The editorial and publication ethics of the UGJ is based on the recognition of universal moral norms that are common to different social groups, their application in the scientific editorial process in order to comply with ethical norms in relations between the main participants of this process - Authors, Editorial Board, Editors, and Reviewers. For the journals which are published or co-founded by the National Academy of Sciences of Ukraine (UGJ is one of them), the main issues of legal and ethical norms of cooperation, as well as the responsibilities of the Editor-in-Chief, Editors, and the Editorial Board are set out in the “Regulations on Scientific and Periodic edition”, and the editorial team of the UGJ is strictly adhering to it. The Regulations are regularly updated in accordance with world standards in this area and recommendations of international academic databases. The main provisions of the journal's publishing ethics are formulated and implemented, on the above-mentioned principles. The Editorial Board of the Ukrainian Geographic Journal is approved by the decision of the Division of Earth Sciences of the Presidium of the National Academy of Sciences of Ukraine. It is composed of leading national scientists (20 members, including 17 Doctors of Geographical Sciences) and foreign scientists (6 members) who are recognized experts in this field. The composition of the Editorial Board, indicating the scientific degree and affiliation, is posted in the Journal and on its website. Editorial team regularly informs the members of the Editorial Board about the main issues of the publication preparation, consults them, engages them in articles reviewing, and sends them all Journal’s issues. The most of Editorial Board members are the authors of articles in this edition. The Editorial Board accepts and examines complaints concerning compliance with editorial policy and ethics. Corrections, clarifications and apologies are provided when necessary. All documents associated with the examination are stored in the archive. The Editor, guided by the principles of objectivity regarding the quality of the paper, respect and impartiality on any grounds regarding the author’s personality or affiliation, examines all papers submitted to the editorial office. Decisions are made regardless of race, gender, age, sexual orientation, religious beliefs, ethnic origin, citizenship or political views of the authors. They must comply with the recommendations for authors, which can be found in each issue of the Journal and posted on its website. In case of non-compliance with the recommendations, the editor sends suggestions to the author in the correct and substantiated manner, while respecting the confidentiality of provided comments. All accepted articles are sent to the reviewers of the corresponding profile. According to the publication ethics, the main task of reviewers is objective assessment of papers concerning their originality, scientific and practical significance, completeness of representation, validity of research results, novelty, and compliance with national legislation and international legal norms. The Editorial Board has developed and approved the recommended list of issues which will be taken into account while examining the article. Proposals must be substantiated, aimed at improving the quality of the article. This is especially important for authors - young scientists and postgraduates in their further work. Reviewer assists Editorial Board in decision-making while provides professional advice for authors to improve the manuscript. Reviewers should also identify relevant published work that has not been cited by the authors. To avoid personal, preoccupied perception of authors by reviewers, “blind” reviews are practiced (without indicating names). Reviewers should have no conflict of interest arising from relationships with authors and organizations regarding to the paper. In case of revealed conflict of interest as well as circumstances which make impossible to review a manuscript, referee should notify the editor immediately. The authors' answers to the reviews come to the editorial office. If the author does not agree with the comments and suggestions of the reviewer, other experts are involved and a general conclusion is formed. The editor in a correct form informs the author about this conclusion. To avoid personal conflicts, the editorial team must respect confidentiality. Any reviewed manuscripts must be treated as confidential documents. They must not be discussed with others except as authorized by the Editor. After coordination of all questions the article goes through professional and literary editing; the final version of the article is signed by the author. The content of each issue of the journal is approved by Academic Council of the Institute of Geography. When preparing publications, the authors should follow the recommendations presented on the journal's website as well as participate in peer review process taking into account suggestions and corrections. Sources of the financial support of the research have to be shown. The author should submit publication that contains the original research results and their analysis, correct references to the sources used are necessary. The author should not submit the manuscript that has already been published (submitted for publication) in other editions and contains a description of the same study. The responsible author should ensure that all persons who have made a significant contribution to the preparation of the publication are included as co-authors. When the authors revealed an essential errors in the published work, they must immediately notify the editorial team and cooperate with it to correct the errors or recall the document if necessary. Copyright is ensured by adhering to all specified procedures for editorial preparation of the article for publication, which ends with the License Agreement between the author (co-authors) and the publisher, represented by the Editor-in-Chief. Due to the fact that the authors do not pay for publishing articles in the Ukrainian Geographic Journal and do not receive a fee for their articles, there are no conflicts on the financial grounds. Persons who have discovered a violation of the “Regulations on Scientific Periodicals” or the principles set in this Statement should provide sufficient information and evidence for the investigation (texts, records, photos, etc.). In special cases (violation by the editor-in-chief, systemic violations by the editorial board), information is transferred to the Scientific and Publishing Council of the NAS of Ukraine. Minor violations of ethics are eliminated during consultations of the persons involved (authors, reviewers, editorial board, independent experts). official letter to the State Department of Intellectual Property (Ministry of Education and Science of Ukraine), NAS of Ukraine. The author who committed repeated violations of ethical principles loses the right to be published in the journal for 10 years. In the archive of the editorial office, particular articles are kept in electronic format from 2003, the full version of the journal since 2008. No. 4. Full electronic formats of the journal are transferred to the Electronic Database of the National Library of Ukraine named after V.Vernadsky and are posted on the website in six months after the publication. The founders of the Ukrainian Geographic Journal are the National Academy of Sciences of Ukraine, the Institute of Geography of the National Academy of Sciences of Ukraine, the Ukrainian Geographical Society, and the publisher is the Institute of Geography of the NAS of Ukraine. 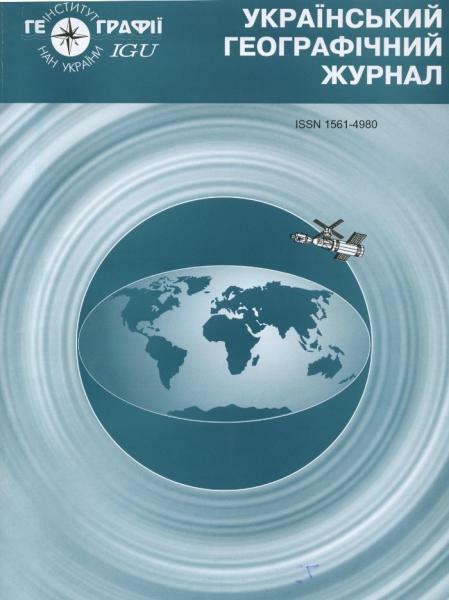 This information, as well as the type of the journal, the year of its foundation and the frequency of its release (1994, quarterly), are indicated on the title page. The Journal's website meets the requirements established by the Scientific-Publishing Council of the National Academy of Sciences of Ukraine, supplemented by the SCOPUS recommendations.